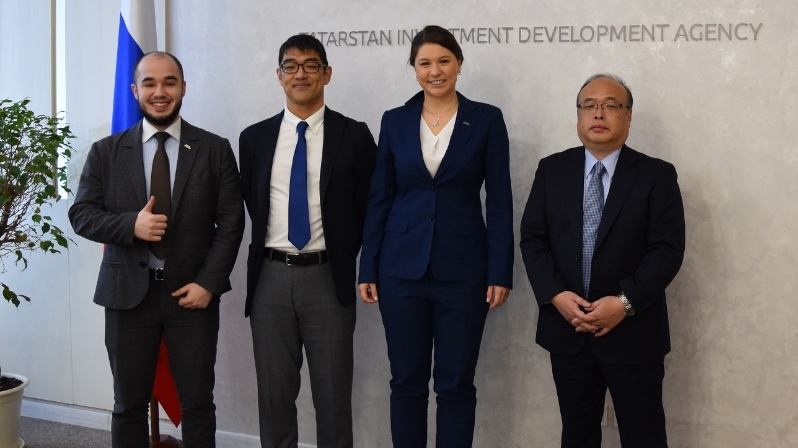 Today, the Head of Tatarstan Investment Development Agency Taliya Minullina discussed cooperation options with the representatives of a number of large Japanese companies. First of all, the guests got acquainted with the economic activity of Tatarstan in the Unified Presentation Center of the republic located in the Agency. "Thank you for such a wonderful presentation of your republic. Wherever you look, whatever sphere you take - you are number one everywhere!" - the guests admired with a smile. "We have good relations with Japan, many joint projects, including investment. Surely, effective cooperation requires close contact between the parties. I have been to Japan several times and I want to say, I am delighted with the unique Japanese culture. I have visited such cities as Tokyo, Kyoto, Kanazawa and others with working visits. Traditionally, we hold the Tatarstani-Japanese Business Forum in your country," - Taliya Minullina mentioned in her welcoming speech. Among the current Japanese partners of Tatarstan the Head of the Agency singled out such companies as Yokogawa, Sojitz, IIDA Group, Soramitsu, and noted at the same time that the republic is ready to expand cooperation. "We will adjust the program of your business trip with pleasure to make it as effective as possible to strengthen business ties with Tatarstan. Indeed, we will provide comprehensive support for the interaction of countries andregions and the implementation of investment projects", - Taliya Minullina noted. "Thank You! It is important for Japanese companies to build relationships with Russian companies. At the same time, Tatarstan has a number of advantages, including geographical position, logistics, prices. In addition, we use environmentally friendly technologies in our activities, while we need a clean region. And in general, we feel like coming back here for more", - representatives of Japanese business marked. During the meeting, cooperation in the fields of food and chemical industries, as well as pharmaceuticals was discussed.